Remember how I said that I thought the W9RE switchbox had terrible isolation? Well, although I didn’t measure it with a VNA, I was doing some testing the other day and noticed that it only seemed only bad when the left radio was transmitting. For example, I put the left radio on 40 meters and the right radio on 20 meters. There was terrible broadband hash whenever I closed the PTT line on the left radio. So, I put the right radio on 40 and the left radio on 20 and transmitted again on 40. No hash, just some faint trash that followed the keying. I had noticed during the Sprint that the vacuum fluorescent display on the left radio was flickering following the keying. But, I didn’t give it much thought until now. I flicked the meter selection switch to Vc and sure enough, it was too high (>28 volts) on transmit. Plus, it would spike and pin the meter whenever I released the key. Today, I built a band decoder cable (fortunately, I had stocked-up on the mini-DIN plugs and the PIEXX board uses Yaesu BCD format) for the Yaesu FT-840 and put it into the left radio position. It’s clean, too. 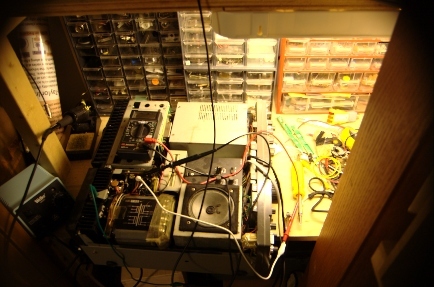 The left ‘930 is now on my workbench, which is barely large enough for it. It turns out that there is a substantial (4 volts peak-to-peak) ripple on the power supply when I close the PTT. I sent a note to the TS-930S reflector; but, unless KA5IPF answers it, I’m probably on my own. I suspect it’s just going to be a matter of disconnecting subsystems until I find the offender. Until then, I’ll be using the FT-840 and the old TS-930 for SO2R. But, at least I’ll be able to hear! I’m also relieved that I probably won’t need to rewire W9RE’s switchbox. I just need to build some short jumpers and W3NQN filters for all bands. Sarah has suggested several times that I should consider working-out. A few weeks ago, she finally prevailed and I started going to the gym while she was doing water aerobics. 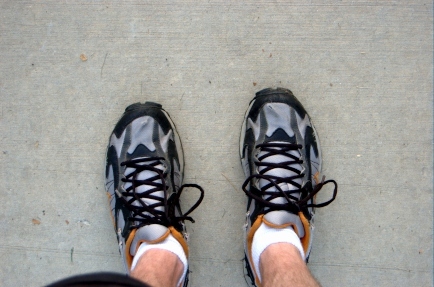 For me, going to the gym is a little like watching a childrens’ Christmas pageant. You know it’s the right thing to do; but, it’s a little painful and worst of all, it’s mind-numbingly boring. I had a good work-out today. I actually was happy to be there for the first twenty minutes or so. Have I pushed through the burn of boredom? Time will tell. I did feel like a million bucks when I finished. I do enjoy that feeling. The 10-40 dipoles favor the E/W direction, although on 40 most of it goes straight up. The 80-meter dipole would favor N/S if it mattered. 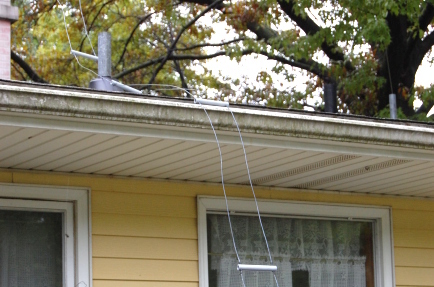 If I install any new antennas this Fall or Winter, they will be receiving antennas for 40-160. We hope to leave Urbana in the Summer of 2009. Destination TBD. A few weeks ago, Sarah and I attended an event that the University YMCA sponsors…Dump and Run. The idea is that students who are moving out in the Spring can drop anything they don’t want at the Y, which is within walking distance of the dorms. Volunteers sort the items and sell them again in the Fall when the students return. Many universities have variations on this theme. I picked-up a nice framing square for 50 cents, a corduroy jacket for five dollars, and a few other odds and ends. 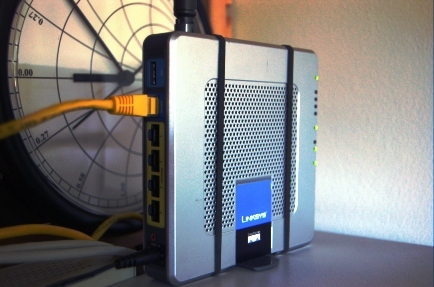 But, the big jackpot was a Linksys WRTSL54GS router. There was no price on it and no price for routers or networking equipment on the general Dump and Run pricing sheet. The top and bottom covers had been removed. So, I had no idea if it had been “repaired.” I offered the guy at the table five bucks for it. He seemed happy; I was happy. I plugged the little box in at home and fired-up my computer. I was greeted by Whiterussian 0.9 instead of the usual Linksys firmware. Brilliant! Although I’m a fairly experienced Linux user, I’d never worked with embedded Linux. So, I read up on it. Not knowing if the previous owner was trying to launder a box that had been used for criminal intent, I reflashed it with a more recent edition of OpenWRT. This gave me a fresh slate to work with to boot. I shot Scott, KA9FOX, who hosts this site, a note about setting up a subdomain to use with router. He suggested that the easiest way to do this would be to setup a free domain with dynDNS and then create a DNS CNAME record for home.k8gu.com that pointed at that domain. Brilliant again! One of the nice things about the WRTSL54GS is that has a USB port. So, you can attach mass storage devices to it. I’ve attached a 128-Mb jump drive that seems to work just fine. But, I plan to do something semi-permanent at some point in the future. There is a set of pads for a second USB port on the board, which are rumored to be hot. I have contemplated hard-wiring an SD-card reader into that port to make a complete package. Did I mention that I’m also using this as a wireless access point? It’s great for the power misers out there. It doesn’t quite have the umph to run SQL, as far as I know. So, it wouldn’t be too useful for a self-hosted blog. But, it seems very capable… I’m already looking for another one; but, I doubt I’ll get that kind of deal anytime soon. A couple of shots with the ole Wrist Rocket and some creativity with the DK9SQ mast got a new line into the tree. I’ll be back on 80 again soon! I’m still trying to figure out what to do with the 6×2 switching system. I found two relays in my junk box. But, I need four more, plus a clue about how to wire it all up. I want to rebuild it as a system like Top Ten Devices suggests. 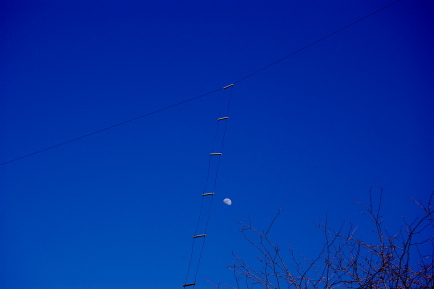 There’s a saying in the ham radio world about antennas: If it stayed up last winter, it wasn’t big enough. Well, my 80-meter dipole / 160-meter vertical lasted from February to September. I guess it was big enough. The remnants of Hurricane Ike passed through Illinois today, dropping four inches of rain in about five hours. It was the wind, not the rain, that did the antenna in. Sarah and I were laying on the floor in our living room looking up into the big tree in front of the house, watching the branches swirl. For good measure, I craned my neck to see where the dipole crossed into the spruce in the other corner of the yard. Indeed, it was still there. Two of my favorite QST articles are “Bedrooms or Beverages” by K1TN (Oct 1994) and “The 20-meter Money-Eater” by W7KCN (Apr 1991). 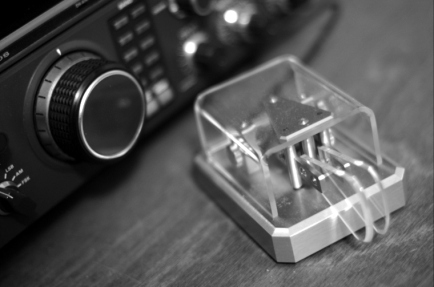 Now that QST is online, you should go look them up. The April 1991 issue is the first issue of QST I ever read. We picked it up at a used book sale before I was licensed in 1993. It has a lot of hilarious articles in it. The DXDC (DXCC deleted countries) list is quite funny, too. “The 20-meter Money Eater” pretty well describes any homebrew project I’ve ever worked on. The first year Dad and I were ARRL members was 1994. Those QSTs got dogeared in a real hurry. Either QST was better then, or I’m jaded now, or both. Anyhow, I didn’t even know what a Beverage was when I read “Bedrooms or Beverages.” In fact, I didn’t know what half the article was about. But, it was good reading. I read it again recently when I was at Mom and Dad’s place. It’s even funnier now that I’ve thought about doing some of the things K1TN tells about. I actually had an e-mail exchange with him a few years ago about joining a Sprint team in which I told him it was my all-time favorite QST article. He said that all of his years of writing/editing for QST were worth it when people told him things like that. I always enjoy his writing. I didn’t bring my A-game to this one. The first and fourth hours were decent. But, the second and third hours just plain stunk. As readers of the blog know, I’ve been trying to get my station almost completely automated. It’s getting there. W9RE told me that his relay box didn’t have good isolation. He’s right. I can hear the broadband noise from my 930’s when I hit the PTT. At this point, I have two options: I can build the KK1L board (not attractive at the moment) or I can add six relays to the W9RE box to add another layer of isolation (this is what I’m leaning toward). 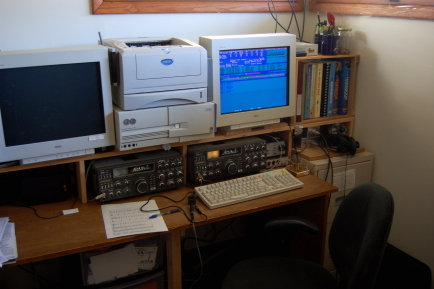 SO2R only works if you can actually hear stations on one radio while transmitting on the other. I did manage to run almost the entire contest without the sidetone this time. Progress is progress. The news isn’t all bad about this Sprint. From a statistical standpoint, my QSO total is basically equivalent to my February 2008 total. But, I did nail a lot more multipliers, including my first KL7 in the Sprint. SO2R was very valuable for about four of my multipliers this time. The NCCC Sprints have really helped me get used to operating SO2R. Although, as K6VVA (I think) said, it’s hard to resist the temptation to dupe. Usually, I do an almost impeccable job duping the Sprint in my head. But, for whatever reason, this time I was surprised how many stations the computer told me weren’t dupes. Glad I had it! That’s probably an indicator that I really sucked in the copying department. Will the Golden Logs continue? The CW Sprint is this weekend. I need to verify that the band-decoders are RF-proof on all combinations of Sprint bands and get the station ready. I’m looking forward to it! You are currently browsing the archives for September, 2008.